Whew. Still jet lagged and to be quite honest, not feeling so great. I got in earlier yesterday from NYC only to nap, eat and nap some more. And thanks to a wonderful boyfriend, I was somewhat pampered back to health. Kinda. Still never got my back rub though (insert blatant hint here). That said, since I knew I was going to be playing a lot of major catch up today at work (read: lots of e-mails, meetings and writing, writing, writing), I wanted something comfy. So ladies and gents, I give you my leggings. Leggings, meet pants. Pants meet leggings. You both are one in the same in my book, fashion faux pas be damned! Plus, how could you hate on anything that allows for sitting cross legged comfortably at a desk? 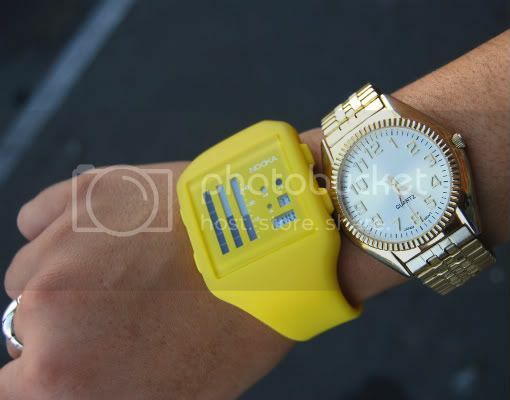 As for the multiple watches, I'm sure I'll get tired of it, but for my trip, it was nice being able to quickly refer to my New York watch (the bright yellow Nooka via the Weardrobe conference, thanks Nooka!) and my regular Reno watch. That way, I could quickly figure out when I could call someone back home. Because let's face it, who has the time to add or subtract three hours to configure that kind of stuff? Not this gal. Plus, I'm horrible at math. True story. That does it for me. I think I'm due for another nap. In the meantime, please disregard the sea monster about to attack me. He's quite friendly, actually. That's a cute, quick outfit! And doesn't cost much either! Ahh, different time zones for different watches... good call!! You look cute. Glad you are back to your regular posting. Hope you had tonnes of fun too. cute! i love the urban fitter top. i adore the watches, and leggings are always an amazing classic look. so cute. I'm copying this outfit tomorrow!! (Ok! I won't copy, but I am going to take the idea and make it my own... is that ok?) I love it!! You look so darn chic, but comfy!! 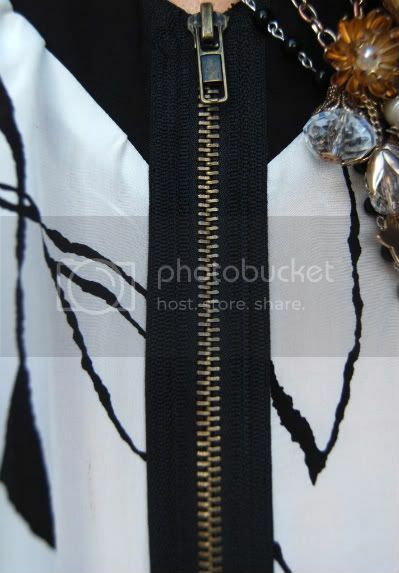 Awesome zipper on that top!!! Cute Nooka watch! I love your outfit as well, and yes, leggings as pants are very very comfortable. i wanna have that top! so beautiful! Amazing denim jacket. SO casual and chic! this outfit really strikes all the right notes. absolutely LOVE it- and the greatest thing about all the peices you are wearing is that though it is "THIS MOMENT" and super-on-trend, everything you have on is versatile and will last long past the current season. I totally feel the same way about leggings. You totally rocked them! Welcome home! Love the two watches idea, they go well together as well. I love that tank top! I might have to buy one. Love it all, especially the yellow watch. where's your bag from? it's simple but i love it! my friend has a pricey one like that from Coach, but I just want a cheap-o version! for a comfy outfit, this one is still super chic! i too wear leggings as pants from time to time...oh well! you always find great things at Old Navy.. I never do. bravo this looks great! i love your watches alot! I love all the backgrounds you use in your pictures :) Hope you had fun in NYC! I've been slaving away with papers. Blahhh. Your blog is very good, I am following. I loved the yellow clock! yay, someone else who completely ignores the leggings as pants rule! I agree, so comfy! you look great and I'm completely jealous of your NOOKA watch! ps- thanks for your photo advice earlier, it worked! If I had legs like yours, I would rock the leggings as pants look too! And I am totally digging the two watches at once. Especially since they are completely different! Oooh the watch is the perfect pop of color here!